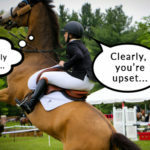 Flies around horses and in barns can be a very annoying occurrence, but unfortunately at some point in time, you can’t seem to have one without the other. Even though horses are all born with a pretty good built in fly swatter (their tail) it is never enough to keep the pesky flying insects from leaving bite marks on your favorite equine, or helping to break up and chip his hooves from continuous stomping to shake them off. 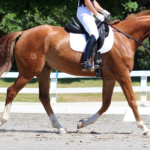 While it’s extremely difficult to eliminate them all, there are many important and beneficial things you can do to cut down on them drastically and keep them from bothering your horse, or even yourself. Today we’re going to discuss the top 23 ways in which you can both prevent, eliminate and protect your horses, barn and self from annoying fly and insects that just can’t quit you. Flies live roughly 21 days. 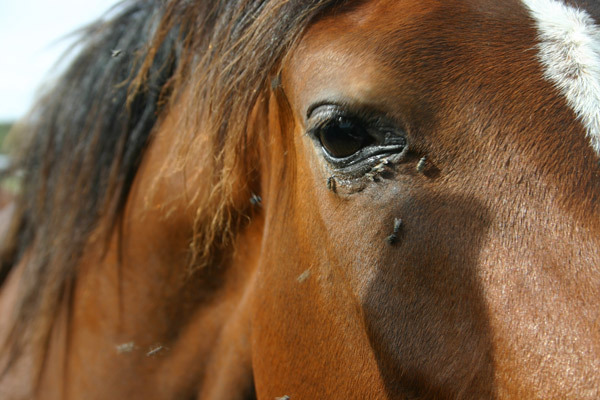 The three most common flies you’ll find in the barn are house flies, horn flies, face flies, stable flies (also known as horse flies, the nasty ones that bite) and gnats, the little tiny flies that swarm around manure all day, but rarely bother you or your horse. There are also flies called bot flies that actually love to lay their eggs in your horse’s coat. Despite what you may think, generally, a house fly’s main purpose in life is not to annoy you and your horse… it’s to help the environment decompose rotting, organic matter such as manure, dead animals, plants, and more. The more rotting and decomposing matter you have laying around, the more flies you’ll attract. For this reason we find them in barns and around garbages or dumpsters. Flies have four stages in life. Adult flies lay their eggs in or around a rotting food source. These eggs actually hatch within hours of being laid into larvae (maggots). These wormy little guys eat for about 5 days and then form a cocoon, not unlike a caterpillar. Unfortunately, in about 3+ days they transform into a full grown adult fly with wings instead of a beautiful butterfly that has about 10-12+ days left in it’s life to annoy you and your horse, and to lay more eggs. Not only that, female flies can lay from 40 up to 80 eggs. However, the 8+ days the fly spends as an egg, larvae and then pupa is to your advantage. This is the best time to kill them and break their life cycle. Many fly control products attack the fly in it’s pupa or cocoon stage, which look like tiny grains of dark rice. Keep your barn clean. If you eliminate the places flies love to breed, such as manure, they can’t make more little flies. There is no food source a housefly likes best than a fresh pile of manure or even dog or cat poop! Follow best practices for mucking out stalls, keeping fields picked and storage and disposal of manure away from the barn, as well as cleaning up waste from other barn critters, so that they won’t be a nuisance. Keep your barn dry. Insects as well as flies are attracted to standing water where they both breed and drink. Keep stalls nice and dry, eliminate standing water in fields, and make sure your pastures have good drainage to avoid water accumulation. Treat & Tarp and removal of manure piles. Removal of mature piles each week is key. If you don’t leave the piles on your property long enough for the flies to lay their eggs, and hatch and develop into adult flies, you won’t have flies on your property. While it’s not possible for everyone to get manure removed that often, you can put a tarp on the pile, to prevent flies from landing on it, as well as treat it with pesticides or fly parasites that will attack both larvae and adult flies. Dispose of decaying, soiled hay. More so than manure, the nasty biting stable flies love to breed in piles of wet, soiled, moldy, old hay. To prevent stable flies from breeding it is important that you make sure you are not only cleaning up manure from your property, but that you are making sure to clean up and dispose of old and uneaten hay and hay piles as well, both in the stall, barn (and hay storage area) and in the horse fields. Dispose of trash, especially human food, in proper, covered containers or receptacles to prevent flies from getting in and laying eggs. If you make sure to dispose of your garbage every 7 days, even if a fly was to lay their eggs in your trash, you’d be removing them from your property before they turned into buzzing, breeding, pesky, air born adults. 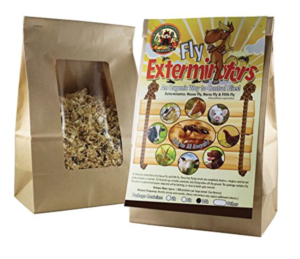 Eliminate the adult flies and larvae with insecticides, pesticides and larvicides. If you eliminate adult flies, not only are you ridding them from the barn, you are reducing the chances of them procreating. If you are eliminating flies in their larvae stage, you eliminate the chances of them growing into adult flies that can breed. Pesticides and larvicides are typically chemical sprays designed to attack and kill flies in those particular stages. Keep your barn odor free to prevent attracting flies in the first place. Flies are attracted to specific scents and have a great sense of smell, which allows them to find what they want very easily. The best way to help prevent attracting them is to make sure that your barn is odor and ammonia free. Drag and rake your horse fields. By dragging horse fields you allow manure to be broken up into smaller pieces and spread out. This allows the manure to dry out faster, eliminating the moist parts of it, that the flies need to breed and mature. They don’t thrive in dry conditions. work to both kill and discourage flies from landing on and biting your horse. 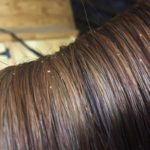 Unfortunately, they tend to wear off quickly, depending on the quality of the product you’re using, especially if your horse is sweating or gets a bath after your ride. Flies in certain areas have even been known to develop a tolerance to certain brands and ingredients. When using fly spray on your horse for the first time, be careful. The spray may actually frighten them if they are not used to it. Some horses are even sensitive to the spray “tickling” them. You also need to take caution not to get the spray in your horse’s eyes. If you want to apply it around their eyes and nose, put the spray on a cloth or towel and use it to wipe it on instead. Active ingredients in effective products contain botanical pyrethrins, synergists, and synthetic permethrin and cypermethrin. Always make sure you read the label and specifications for every product. 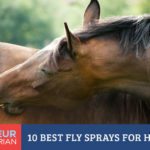 Click on the link to check out our review of the Top Ten Fly Sprays. Fly Gels & Roll-Ons. 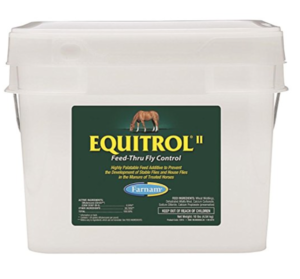 Great products to help you target fly repellant on specific areas of your horse that are specifically prone to fly irritation, such as around the eyes, ears and nose. Shampoos. 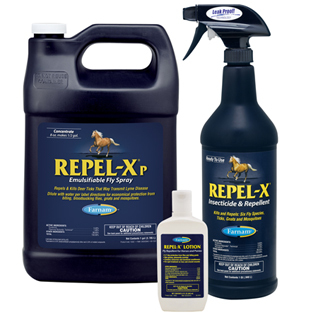 Fly repellant shampoos are a great way to make your horse less desirable to flies. Simply wash your horse using one of them and the residue from the shampoo will leave your horse smelling unsatisfying to the winged pests. Fly Sheets. 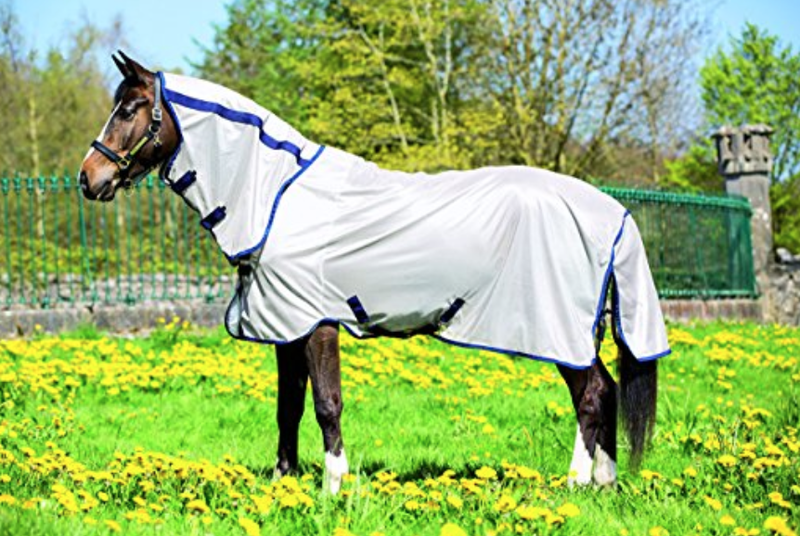 Flysheets are essentially big, lightweight, and breathable mesh horse blankets that they can wear in the summer to keep flies off and prevent bites. They work well and can even double as a UV filter for you horse, to prevent his coat from bleaching out due to too much sunlight. The only catch is that sometimes the fly sheets can get heavy and during hotter weather, cause your horse to sweat under them. Also, if your horse is notorious for rolling and snagging blankets, or he has a field buddy who loves to bite and rip his blanket, you may find that this is just not a viable option. The heavier more well made fly sheets are extremely durable, but as indicated before, can get too warm for your horse on hot summer days. Horse Fly Masks. I am a big fan of fly masks. They keep flies out of your horse’s eyes, as they are attracted to the moisture and especially discharge if your horse’s eyes are watering. They also work as dirt and sun shields for horses with sensitive or light colored eyes. Horse fly masks come in different types and shapes, some also protecting the horses ears, and even his nose. I find that they also help prevent face scrapes and cuts on horses that are notorious for sticking their heads through the fence or are constantly itching and rubbing their eyes. Plus, it’s always funny to hear your non-horse friends ask you if that horse wearing the mask “is blind.” For fly sheets and masks my favorite brand has always been Kensington. They’re just very well made and durable, high quality fly masks. Their fly sheets can be a little heavy for the summer days but they work especially well if your horse is on cooler evening turn out. Fly Traps & Tapes. Fly traps and tapes are products that attract flies both by sight and by scent, and prevent the flies from leaving or going off to breed. The ultraviolet electrocution traps (or fly zappers) attract the flies by light and are great for killing both house and stable flies. 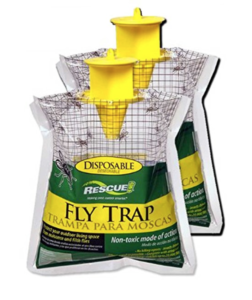 There are other baited traps that are containers that the flies go inside and get stuck in which are only really effective on house flies, but not the blood sucking stable flies. Fly tapes are also great at catching them, once a fly lands on the strip, he gets stuck to the tape and is unable to move. Traditionally you don’t necessarily want to put fly traps directly into areas of the barn where horses are, because they actually attract more flies to that specific area. Instead, you may want to keep them on the outskirts of the area you want to protect and keep down the population so they work additionally by actually luring flies away from areas they love to breed and bother your horses. Also, regarding fly tapes… make sure you hang them high. Trust me when I tell you there is nothing more gross than getting your hair stuck in a fly tape by accident. Fly Bonnets. 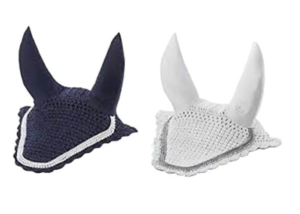 Adorable little knit fly bonnets that equestrians get their horses, sometimes even if they don’t need them! They cover the horse’s ears and forehead and are worn with the bridle, to prevent flies from bothering your horse while riding. 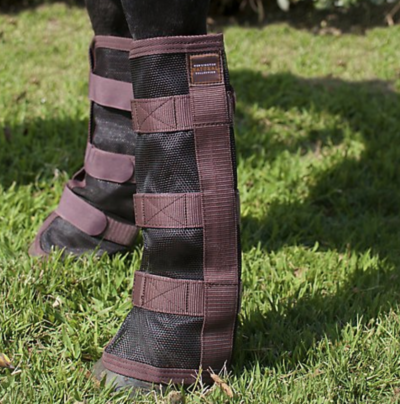 They are great for sensitive horses who tend to be really prone to insects bothering them, during trail rides, and especially during horse shows and competitions, where having your horse throw or shake his head would potentially be a big problem. Barn Spray Systems & Premise Sprays. A newer yet wonderful technology, fly spray systems are great for keeping down the unwanted insect population inside your barn. The system automatically sprays a fine mist of insect pesticide or repellant at designated places (where ever you set up the sprayers). You can use a wide variety of sprays with the systems, and you can even set the sprayers to go off constantly, at certain times throughout the day. 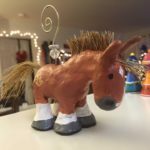 They require very little maintenance and are a great addition to your barn. Fly Parasites & Predators. Lucky for you mother nature has invented a fly control insect that loves to break the fly lifecycle and keep them in check. “Fly Predators” are tiny, non-stinging wasps that hang around the same areas where the flies like to lay their eggs. The wasps both lay eggs in the fly pupa, as well as feed on the flies while they are in their larvae stage, preventing adult flies from ever developing. They keep the population in check, but in barns that have aggressive and thriving fly communities, you can actually even out the playing field by introducing more of the fly predators into your barn to help pick up the pace. There are companies that ship the fly predators directly to you. All you have to do is open them up and distribute them all over your barn in areas where flies most love to breed, and these little guys will hatch and get the job done. Best practice is to continue to release new fly predators into your barn every 3-4 weeks from April to September to make sure there are enough of them to continue to control the fly population until the end of the summer. Believe it or not they even ship direct from Amazon! Feed-Through Repellant. Exactly like it sounds. Feed-throughs are a product that you feed to your horse that passes through his system. Internal fly repellants if you will. As they pass through the horse’s system they cause him to secrete oils that discourage flies from biting him. There are many different types on the market, and even home remedies that people swear by such as apple cider vinegar. Flies smell with their feet, and they’ll notice your horse smells bad and decide to avoid him. Insect Growth Regulators. IGR are feed-throughs that when they come out the other end in the mature, regulate the growth of adult stage insects from forming. 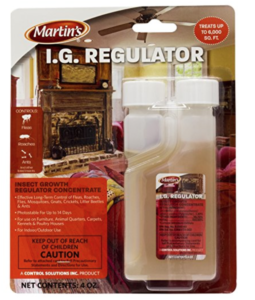 IGR’s work by disrupting the pupa (molting stage) of the fly’s life cycle by using a horse-safe active ingredient like cyromazine. 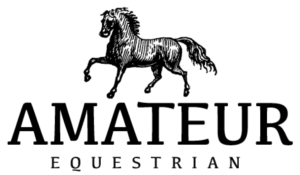 The cyromazine is excreted into the horse’s mature and prevents the fly’s exoskeleton from forming properly, causing them to die before they fully develop and ever get the chance to breed. In order for IGR to be most effective, you will want to feed it to all horses at your barn. Screens. Screens on office doors and even on stalls can eliminate flies from bothering both you and your horse. It can also be a great way to keep them out of feed and tack rooms, while still letting the air circulate. Fans. Fans not only help to keep your equines cool in the barn, they also help to keep the flies out by either pushing them down and out of the barn, or making it harder for them to land on and bother your horse. Make sure your fans are barn safe and that the wires are kept out of the way from accidents.